Gina is just out of a long term relationship, she is leaving behind a time in her life she would rather not dwell on- heartbreak, illness and an uninspiring marriage. It is her opportunity to start her life anew and she takes it with both hands and never looks back. The book focuses on her ridding her life of all the items she had hoarded over the years, which is no mean feat for chronic collector Gina. Along the way she befriends an abandoned dog, Buzz and client, Nick. As she clears her present of her past she unearths some of the things that had been holding her back from really enjoying her life and slowly she learns to embrace her future. The story line flies between past and present events, spanning about twenty or so years. To start with I found it hard to keep up with the switching dates but they also allowed me to get to know Gina and how her character had progressed. The premise of the book is that Gina is going to keep one hundred items that mean something to her, in the process getting rid of everything that is cluttering up her life. Each chapter starts with an item that she will keep and it is accompanied by the story of how the item came to being. I thought this was a lovely touch and gave me a real insight into the inner workings of Gina's mind. It also made me want to throw out all of my stuff and start all over again. I feel like it would clear my mind and it also puts into perspective what is really important- do I really ANOTHER pair of shoes? There was something about the book that I found so familiar and there were points where I forgot that I was merely the reader. 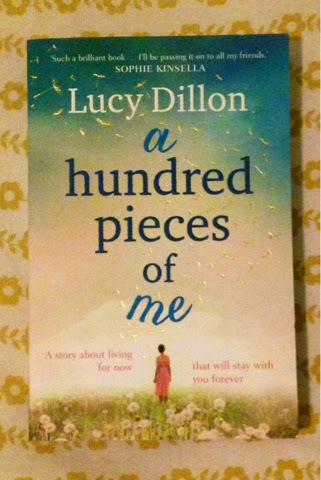 It was almost as though Lucy Dillon was peering into my mind and writing accordingly- it was a weird experience but obviously one that not every reader would have! I thought there were a good selection of characters and I felt they were all developed sufficiently. As much as the book revolves around a number of Gina's relationships with men, I liked that in the end the focus was on her new found friendship with a dog. As the owner of an adorable Labradoodle, I could entirely relate to the feeling of responsibility and unconditional love you can feel for such loyal creatures. The only complaint I have is that I felt the story lines were all developed so well but were rushed a bit in the end. To me the story line lacked a good balance and I finished it feeling as though I had been robbed the ending I felt it deserved. Despite the ending, I absolutely loved the book and would definitively recommend it! Please let me know what you thought of it or if you think you will go on to read it!